Writing your electrician resume can be a challenge. Even people who have been electricians for many years, and suddenly have to look for a new job, sometimes face the same problem. There is a multitude of resume writing services online and off, so if you are really struggling with writing your resume, maybe you should hire someone to help. But first you should try to write your own. There are also many sites that guide you through the resume writing process. These are a great resource. You will see how your resume should be laid out, what to include and what to leave out. It is a brief autobiography. The “auto” part means self, and “biography” is basically life story. Who knows your life story better than you? No one. So, it is best to write it yourself. You may want someone to look it over when you are done. Nothing gives a worse impression than a resume full of spelling mistakes or grammatical errors. Since it is designed to be brief, do not start with your birth. Your high school days and any jobs you held while attending high school is the best place to start. Unless you have been in the workforce for many years, then you should go back maybe ten years. If you have been in the workforce for a while, but decided to change careers and train to be an electrician, highlight that point. But if this is the case, then most likely the company where you received your electrician training to become an apprentice will hire you full-time. Then you will not need an electrician resume at all. 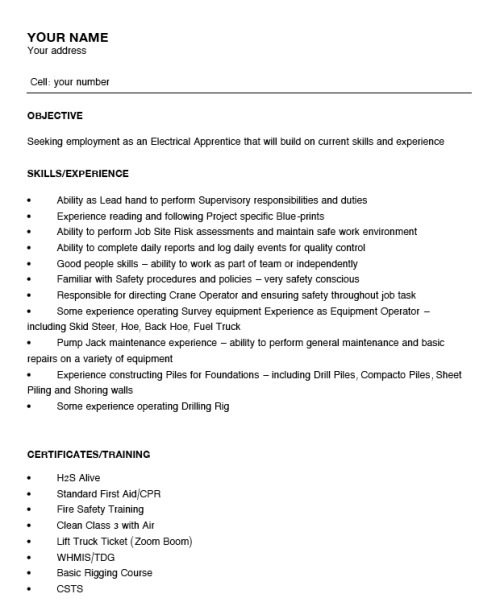 The most important thing to remember when writing your electrician resume is to highlight your strong points. Many people pad their resume a bit, but it is best to be honest, especially if you plan to work as an electrician. Claiming you can do something that you can’t could jeopardize your life, or the life of a co-worker. The best part about getting the right electrician training, and working as an apprentice for several years, is that you will not have to stretch the truth. You will be fully-qualified, able to perform any duties the job requires. But still, be truthful. Highlight the training you received and how well you did. It is important to list any volunteer work you have done, especially if you have not had too much work experience. Extra-curricular activities that demonstrate desired skills and qualities a potential employer may be looking for are also important. Experienced resume writers will tell you to include hobbies. Some employers like to see that, as it tells them more about your personality. No one wants to hire someone they will not be able to get along with, so getting to know a bit about what type of person you are will help them decide if you are someone they would like on their team. I drew up this simple electrician resume as a guide to help others build their electrician own. References are very important. Make sure the references you list are relevant to the position you are applying for. The electrician you trained under, and the teacher who taught you the coursework section of your electrical training, are excellent references. Ask for their permission first, though. This is not required, but it is a good idea. Many people will just put on their resumes “references available upon request.” Potential employers do not like to see that. If they are interested in you, they want to pick up the phone and call your references right away. They do not want to track you down first. They want to know everything about you while they are holding your resume in their hands. Once they put the resume down, you are out of the running. In most cases they will have a pile of resumes to go through. If they have to track you down to get references, they will just move on the next resume in the pile. 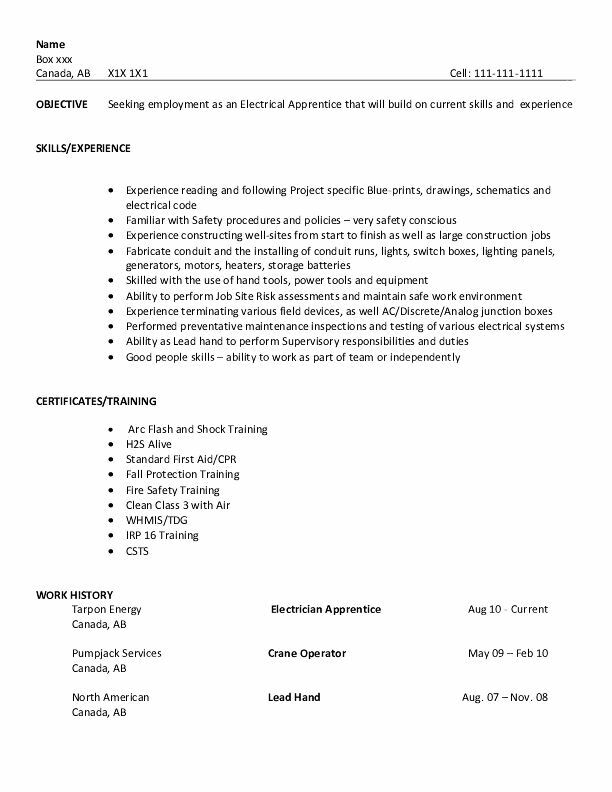 Your electrician resume is your opportunity to introduce yourself to potential employers. You want to make an impression he will not soon forget. It is your only chance to stand out from the crowd. So, you have to make sure it commands attention. You have to make sure it is a resume that will not be put down until after the potential employer has called you in for an interview. Your resume should have all of your contact information right at the top. This includes your name, address, telephone number and email address. The first line will state your reason for contacting the company, commonly called your objective. Of course, all employers know a resume when they see one. And they already know why you have sent this to them, but you should include that section anyway. Briefly describe the non-electrical work you have done; describe your electrician training in detail. Potential employers want to know if you are suitable for their company. They want to know how much training you will need to join the team, so it is important for them to know what you have already learned. To just say you completed the electrician training course and three years’ apprenticeship may not be enough. Go into quite a bit of detail of exactly what you learned and the certification you received. There is a fine line between covering everything you need to cover, and making the electrician resume too long. No-one has time to go through a three-page resume. Emphasize your electrical experience and touch lightly on everything else, and you will have a fabulous electrician resume. In order to best help you with writing your electrician resume, I've partnered with "amazingresumecreator.com." These guys are pros when it comes to writing a killer resume. If you feel you need more help I'd highly recommend giving these guys a chance to help you out.